Description: Wonderfully furnished, relaxing 1 bedroom apartments with stunning sunset views over the communal pool.Each Apartment is individually and uniquely furnished and offers self-catering facilities. They feature fully equipped kitchens with appliances, crockery, glassware and utensils as well as living rooms which feature televisions and DVD players. Additionally, all properties have an iron and ironing board as well as a hair dryer for your convenience. Complimentary tea, coffee and biscuits are provided upon arrival. Apartments have a variety of spectacular views and guests have access to a communal pool. This Summer you will enjoy Free Wi-Fi throughout your stay. Description: Wonderfully furnished, relaxing 2 bedroom apartments with stunning sunset views over the communal pool. Each Apartment is individually and uniquely furnished and offers self-catering facilities. They feature fully equipped kitchens with appliances, crockery, glassware and utensils as well as living rooms which feature televisions and DVD players. Additionally, all properties have an iron and ironing board as well as a hair dryer for your convenience. Complimentary tea, coffee and biscuits are provided upon arrival. Apartments have a variety of spectacular views and guests have access to a communal pool. This Summer you will enjoy Free Wi-Fi throughout your stay. Design Added values included: Kitchen cleaning pack, Tea, Coffee and biscuits on arrival, Bathroom amenities, Pool Towels, One mid stay clean for a 7 nights stay. We had a fantastic holiday and would stay in Aphrodite Hills again. The staff were excellent and very solicitous about our wellbeing and enjoyment. Aphrodite Hills is a beautiful resort. It is extremely well-appointed, handy for zipping off to destinations such as Paphos, Limassol and even further afield, to places such as Ayia Napa. In terms of value for money, I feel the holiday was much pricier than it should be. For example, we were quoted 160 euros for a shuttle to take us to the hotel from the airport and back - which, frankly, is spectacularly excessive considering the resort is around 20-25 minutes maximum from the airport! So we cancelled the shuttle and hired a car for a whole week, for exactly the same cost as the shuttle! The prices within the resort are very high. Convenience foods are too expensive (ice creams are exorbitantly priced) and the restaurants are, too (despite the 10% discount you are given as a villa guest). The sports are expensive, too. I would suggest to anyone else to bring their own foods where possible and to outside the resort where you can get very generous meals at a fraction of the cost of the restaurants within the resort. Description: These imposing Junior Villas offer luxury accommodation and a pleasant setting. A BBQ is available for outdoor dining. The Aphrodite Hills Junior Villas also boast unobstructed views to the communal swimming pool. 2 bedrooms, 2 bathrooms, fully fitted kitchen, living and dining area. Complimentary tea, coffee and biscuits are provided upon arrival. This Summer you will enjoy Free Wi-Fi throughout your stay. Description: 2 bedroom / 2 bathroom villa (sleeps 4) with lounge / dining / kitchen area plus private swimming pool. These villas are within walking distance of the village square. This Summer you will enjoy Free Wi-Fi throughout your stay. Description: 2 bedroom / 2 bathroom villa (sleeps 4) with lounge / dining / kitchen area plus private swimming pool. One cannot help but be impressed by the design, quality and position of this Elite villa! Newly built and finished to the highest standard, it is located in one of the most desirable locations on the Resort, offering panoramic views from every aspect.Due to the nature of the property there are some unprotected drops and we therefore do not recommend this property for families with small children. Car hire is essential - Free Wi-Fi. Description: These imposing 2 bedroom / 2 bathroom Superior Villas with private pools offer luxury accommodation and a pleasant setting. They feature a twin bed in one bedroom plus a double bed in the second bedroom. The Aphrodite Hills Superior Villas also boast a stunning private swimming pool. Car hire essential. This Summer you will enjoy Free Wi-Fi throughout your stay. Description: Wonderfully furnished, relaxing 3 bed apartments with stunning views. Each Apartment is individually and uniquely furnished and offers self-catering facilities. They feature fully equipped kitchens with appliances, crockery, glassware and utensils as well as living rooms which feature televisions and DVD players. Additionally, all properties have an iron and ironing board as well as a hair dryer for your convenience. Complimentary tea, coffee and biscuits are provided upon arrival. Apartments have a variety of spectacular views and guests have access to a communal pool. This Summer you will enjoy Free Wi-Fi throughout your stay. Description: 3 bedroom / 2 bathroom villa (sleeps 6) with lounge / dining / kitchen area plus private swimming pool. This Summer you will enjoy Free Wi-Fi throughout your stay. Description: These imposing 3 bedroom / 2 bathroom Junior Villas offer luxury accommodation and a pleasant setting. A BBQ is available for outdoor gatherings. Each Junior Villa is individually and uniquely furnished and offers self-catering facilities. The properties have a variety of spectacular views. This Summer you will enjoy Free Wi-Fi throughout your stay. Description: A beautiful three-bedroom Elite Villa nestled in a quiet side street on the eastern plateau, this Villa redefines luxury accommodation. Car hire highly recommended. This Summer you will enjoy Free Wi-Fi throughout your stay. Description: One cannot help but be impressed by the design and quality of this Elite villa! Set in a quiet and private plot on the Eastern plateau overlooking the ravine, this fabulous property comes highly recommended. Charismatic interior décor, first-class furnishings, fixtures and fittings, and a superb setting all combine to offer a perfect holiday experience. . Car hire is essential. This Summer you will enjoy Free Wi-Fi throughout your stay. Design Added values included: Private Transfers to and from Paphos Airport, Daily Maid Service, Luxury Food Hamper, Branded bathroom amenities including bathrobes, slippers, shampoo, conditioner, body lotion and shower gel, Access to the gym, pool sauna and steam room at The Retreat Spa, Preferential booking status at The Retreat Spa. Description: These imposing 3 bedroom / 2 bathroom Superior Villas with private pools offer luxury accommodation and a pleasant setting. They feature 2 x twin bedded rooms plus a double bed in the third bedroom. The Aphrodite Hills Superior Villas also boast stunning private swimming pools. Car hire essential - Free Wi-Fi included. Design Added values include: Kitchen cleaning pack, Superior welcome pack, Bathroom amenities, Pool Towels, One mid stay clean for a 7 nights stay. This was our second stay at Aphrodite Hills We enjoy the self catering facilities and space / privacy that a private villa has to offer Desigh Holidays are very helpful, knowledgable and easy to deal with Villa 383 is c3.5km from the Hotel / central area, so you would really need a hire car (we took a taxi from the airport & used the car hire firm on site - which was very convenient if not the most competitively priced) The villa itself has level access throughout the main ground floor & pool area - which was important to us. It has a decent sized pool and good outside space with plenty of paved areas & options for sun / shade all day. Sea views would have been a bonus - and as many other villas do offer them - you should ask if this is important to you. The inside of the villa is clean and functional. A/C worked well, kitchen well stocked. The sofas were a bit tired / saggy. The '4th bedroom' is in the basement next to a laundry / boiler room, and we did not use it as it smelt musty / damp with signs of damp in the paintwork above the skirting board. It would be better used or set up as a 'games room' for table tennis or similar as not many people would choose to sleep down there. Our kids refused & ended up sharing a room - so we would say this is really a 3 and not a 4 bed villa. During our stay we have several minor issues with the villa, a few of which were addressed by the management company and others not. This was a little diappointing but did really affect our holiday. Overall this is a good sized, quiet villa, set in a corner plot, with a decent sized private pool and generous outside areas, in a lovely resort. Design Added values included: Private Transfers to and from Paphos Airport, Daily Maid Service, Luxury Food Hamper, Branded bathroom amenities including bathhrobes, slippers, shampoo, conditioner, body lotion and shower gel, Access to the gym, pool sauna and steam room at The Retreat Spa, Preferential booking status at The Retreat Spa. The perfect antidote to British rain and the onset of winter nights. This is our second visit to Aphrodite Hills, this half term week is always gorgeous. Lovely sunshine, but not too hot for children, so lots of time spent in our magnificent pool and garden. The house was fully stocked with everything one would need kitchen and equipment wise. Only bugbear was the satellite TV, signal. Very patchy as I don't think this villa has a satellite dish, just an aerial. The location was superb, quiet, yet only a few minutes drive from the main centre, supermarket, spa etc. All in all we love Aphrodite Hills and will return no doubt next year. Location is perfect, quiet, but with excellent facilities and super helpful staff. Description: A simply lovely, spacious and fabulously located Elite Villa. Modern, quality furnishings, tasteful muted colour scheme and direct sea views blend together to offer an idyllic getaway on this luxury resort. *The pool can be heated at an extra cost; if required please specify when booking. Car hire highly recommended. This Summer you will enjoy Free Wi-Fi throughout your stay. Description: These imposing 4 bedroom / 4 bathroom Superior Villas with private pools offer luxury accommodation and a pleasant setting. They feature twin beds in 2 bedrooms plus double beds in the other 2 bedrooms. 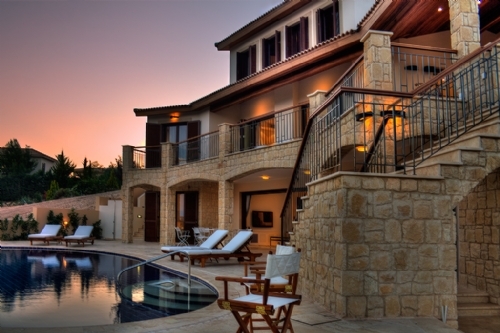 The Aphrodite Hills Superior Villas also boast a stunning private swimming pool and free Wi-Fi. As these Villas are on the Eastern plateau, car hire is essential. Description: If you are looking for a relaxing getaway, a rejuvenating spa experience, or golfing holiday this idyllic 5-bedroom villa will surely exceed your expectations. This spectacular property is one of the largest villas on the resort with electrically operated iron gates that lead to a circular drive and a grand main entrance. Please note that the minimum stay for this property is 7 nights. . Car hire highly recommended. This Summer you will enjoy Free Wi-Fi throughout your stay. Description: One cannot help but be impressed by the design, quality and position of this Elite villa! Newly built and finished to a high standard, it is located in one of the most desirable locations on the Resort’s eastern plateau, offering panoramic views from the outside terraces. Please note that the minimum stay for this property is 7 nights. . Car hire highly recommended. This Summer you will enjoy Free Wi-Fi throughout your stay. Description:These imposing 5 bedroom / 5 bathroom Superior Villas with private pools offer luxury accommodation and a pleasant setting. They feature twin beds in 3 bedrooms plus double beds in the other 2 bedrooms. The Aphrodite Hills Superior Villas also boast a stunning private swimming pool. Please note that the minimum stay for this property is 7 nights. Car hire essential - Free Wi-Fi included. Description: These imposing 5 bedroom / 5 bathroom Mythos Luxury Villas with private pools offer luxury accommodation and a fabulous setting. They feature twin beds in 3 bedrooms plus double beds in the other 2 bedrooms. The Aphrodite Hills Mythos Luxury Villas also boast a stunning private swimming pool. Car hire reccommended. This Summer you will enjoy Free Wi-Fi throughout your stay.